The Government faces no end of scandal in many of its Ministries, from Immigration to Health, Education to Works to Finance. But the hot button issue of the moment is what Prime Minister Dean Barrow himself has called “the hotbed of corruption” – the Lands Department. Former deputy Prime Minister Gaspar Vega oversaw a veritable takeover of many land parcels by members of his family, resulting in his own firing. 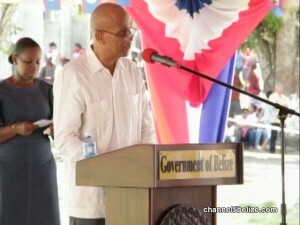 The Prime Minister emphasized the change in leadership that he said has gotten the Department moving again during his Independence Day address. But there was no mention of what will happen to the various lands obtained by the Vega family during his tenure. As to the Public Accounts Committee, there has also been a hue and cry about the composition being lopsided in favor of government. The P.M. says it will be expanded to a bi-cameral entity of the National Assembly, calling for some assistance on the necessary instruments to engineer the change, though said nothing about making the meetings public. P.M. Barrow covered a number of other social justice and anti-corruption issues in his address, from marijuana to oil, UNCAC to the Integrity Commission. Hip hip hurray for this corrupt pm and gov. What will you do about the land grab by the Vega family? This is what the people want to know.